On the first boatloads of Non-English Speaking Background migrants arriving in Australia after the Second World War from 1947-1951 were people of the three Baltic countries of Estonia, Latvia and Lithuania. Some of the migrants found new homes in Tasmania, but today few remain. The male members of these early shipments of migrants who were sent to Tasmania were employed mostly on Hydro-Electric Commission construction projects and in mining, forestry and other industries. Thus the first contribution made by Latvian-born migrants to the development of Tasmania was to provide manpower in places where, due to the remoteness of the location, there was a shortage of manual labour. In later years this contribution included the know-how of six graduate engineers and the expertise of others in senior technical positions. Over the years there have been four Latvian-born medical practitioners and one dental surgeon practising in Tasmania. As a matter of interest, Tasmania is almost identical in size of territory to Latvia and, similarly to Latvia, has extensive forest cover. In the late 1980s the chief forestry commissioner, who helped look after these forests, was Latvian-born Andy Skuja. Two school teachers and three University of Tasmania lecturers of Latvian origin have contributed to the education of young Tasmanians. A number of small businesses has been established by Latvians on the island, too. They include construction, painting, electrical contracting and retailing, the hospitality industry, the jewellery trade and chocolate making. Latvian women worked in Cadbury, Silk and Textile and IXL Jam factories, according to the Australian Department of Immigration and Citizenship. The number of Latvian-born migrants living in Tasmania has always been small and has declined from approximately 363 in 1954, to about 120 in 1990, to 107 in 2001, to 100 in 2008. The majority of Latvians in Tasmania live in the state capital of Hobart and in Launceston un Devonport. One of the first Latvian organisations to be established was the St.Paul’s Ev. Lutheran Church, which became the backbone for the formation of several other groups, including choirs (a male double quartet and a ladies sextet) and a folk-dance group. 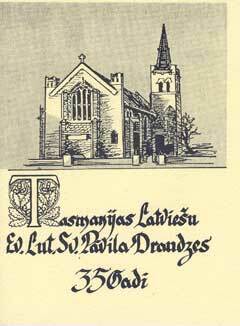 The organisational role of the church community was eventually superseded by the formation in 1981 of the Latvian Association of Tasmania. The church disbanded about 20 years ago, and the Latvian Association closed in December 2004. For at least 40 years, a monthly get-together on the first Saturday of the month for socialising, singing and general comradeship has been held. These gatherings were originally conducted at the home of Ieva and Arnolds Šaulis, but when the number of attendees grew beyond 30 the gatherings were moved to larger premises in the German Australian Association of Tasmania. In recent times this number has dwindled to 10 or less due to the attrition of age and illness. However, the monthly meetings continue from March to December and include marking Jāņi in June and Latvia’s Independence Day in November. 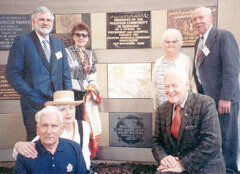 The German Australian club is in Glenorchy, about 10 kilometres northwest of Hobart. A past president of the Latvian Association of Tasmania, Edvīns Baulis, has the honour of being a member of the Order of the British Empire. In 2006, Elmārs Kuplis received the Order of Australia for many years of service to the Latvian community and to the Hobart Baptist church. A quarterly news and literary publication, Auseklis began publication in 1987 and lasted for 71 issues. After the Latvian Association of Tasmania closed, the publication was renamed Rieteklis and continues to be distributed to all Latvian associations in Australia and to several recipients in Latvia and the United States. 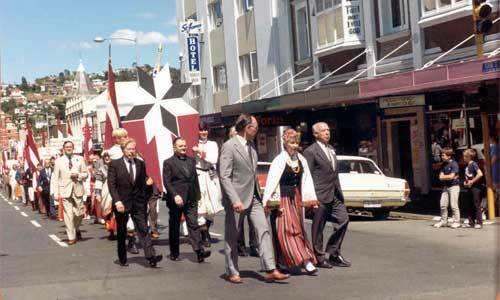 A contribution to the tourist industry of Tasmania was made in December 1984, when a group of local Latvians organised and brought to Launceston the annual Australian Latvian Cultural Festival (Austrālijas Latviešu kultūras dienaas). Some 400 visitors from Australia and other countries came to Tasmania for the occasion. The 1999 installment of the 3×3 culture camp in Australia took place in Tasmania and attracted 70 participants. In sport, the “Stars” Latvian sports club basketball team was the strongest in the state for a number of years during the 1950s and the volleyball team was Southern champion for 14 years. The teams thus helped improve the standard and the popularity of these sports in Tasmania. In the arts and crafts field, Latvians have been represented by Vita Endelmanis, a nationally recognised painter; Zelma Šaulis, a regular top prize-winner in the handcrafts section at the Royal Hobart Agricultural Show; and Peter Dombrovskis, a well-known nature photographer. Dombrovskis (1945-1996), brought the beauty of Tasmania’s wilderness to the attention of the world by means of his photographs. He may have been the first Australian photographer to exhibit at the International Photography Hall of Fame in Oklahoma City, Okla., in the United States. It is amazing how the Latvians spread throughout the world to find new homes rather than live within the comunist USSR, and how industrious they were. As an American Latvian in the 1960’s I was unaware of the existance of any latvian imigrant group outside of the New york area. Later I learned of some in Canada and some on the west coast of the USA. I thought, as many did, that most of the population of Latvia just disapeared or were killed. I suppose it is safer to disperse than to concregate in one place. I never though of Tazmania as a place Latvians would go. It is a shame that the older surviving people could not go back to the homeland as citizens. They held their homeland dear in their hearts. I attended an exhibition of Vita Endelmanis’ paintings about 25 years ago and loved them. Sadly at that time I wasn’t in a position to purchase one, but I have never forgotten them. They were marvellous. I would like to make contact with Ms Endelmanis if anyone could provide me with her contact details. Another name in the current scientific and art world is the marine biologist and wildlife photographer, Dr Aleks Terauds.